Christmas time at St. Hilary's is always great fun for the children, clergy and all the congregation. They all wanted to do something a little different this year so they have put this scrap book together for you all to see photos of how they enjoy the preparations for Christmas. They have had a busy time creating this year's St. Hilary's Advent Calendar too! Do check that out day by day throughout December! The children always know that Christmas is not far away when the church trees are put up! This year they are having a tree outside the church too and Ambrose is busy decorating it. The days are not very long now so he has put the lights on first and turned them on as it is early evening and the sun has nearly set! 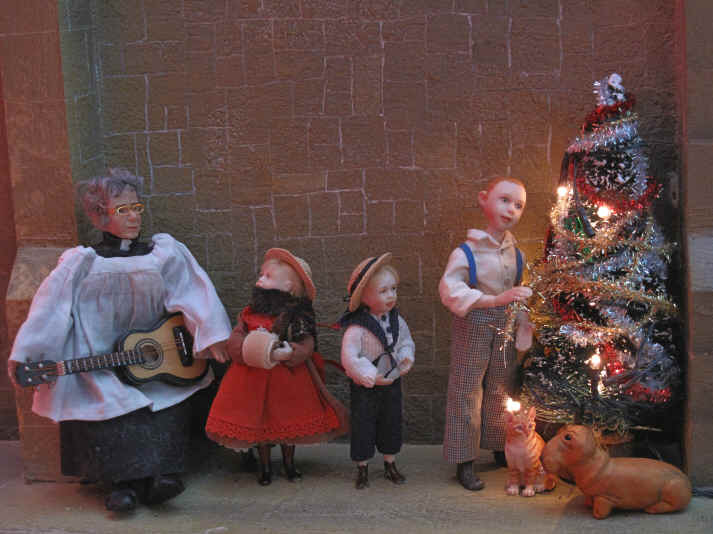 Rev Ken has brought his guitar so that he can entertain the children as they help Ambrose decorate the tree. Look who else has come outside to help too? It is Magnifi-Cat and Bardsley. Poor Adele has had to bring her warm scarf and muff to keep warm! The boys insist they don't need ANY scarves or gloves to keep them warm as they are busy with the tree. Rev Ken keeps his fingers warm by playing the guitar for them! 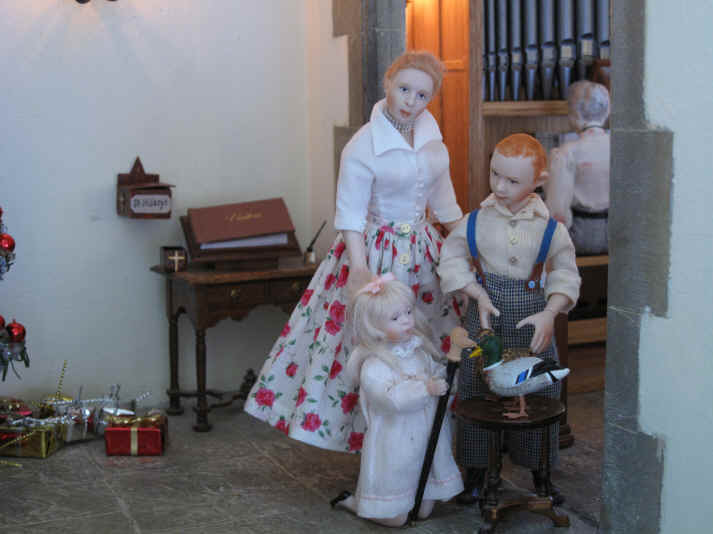 Whilst Ambrose is busy outside Esther is busy setting the Christmas tree up inside the church. Doesn't the angel look lovely on top of the tree. The children insist that the angel is ALWAYS placed there every year! 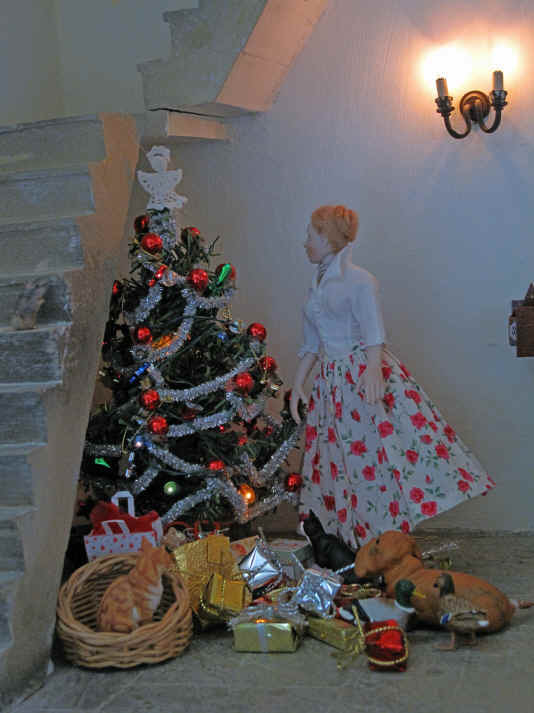 Again they have chosen to put the tree under the bell tower next to Magnfi-Cat's cat basket and cat food bowl! Tinker is trying to get Adele's attention but we think Adele is too interested in her bell ringing to take any notice of her........poor Tinker! 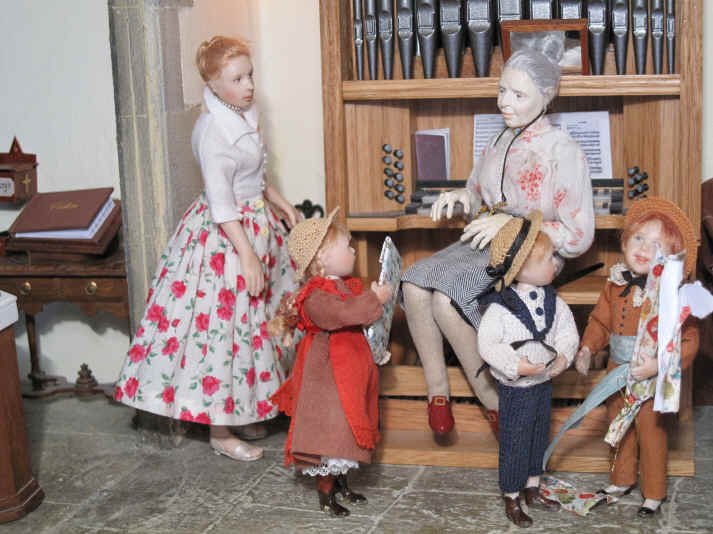 The children have pooled their pocket money together to buy Miss Enid a Christmas present. 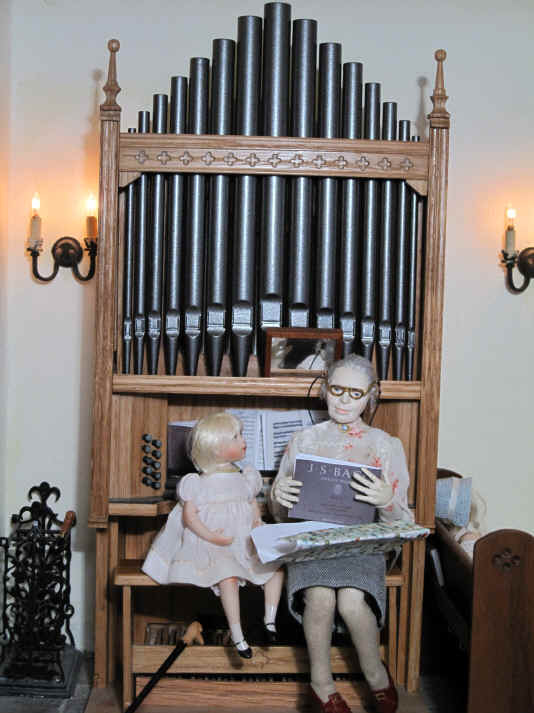 They often hear her say that she is always having to visit the library to renew an organ book she loves to use to play in the services. Sometimes she is late remembering to renew it and has to pay a fine. The children know she can't keep affording to do that as she is now only on a pension and has to watch her pennies. Homer, who used to play the organ back in Germany, had secretly checked to see which book it was and has told Ambrose. Ambrose has just bought the book and is showing it to Homer for his approval! 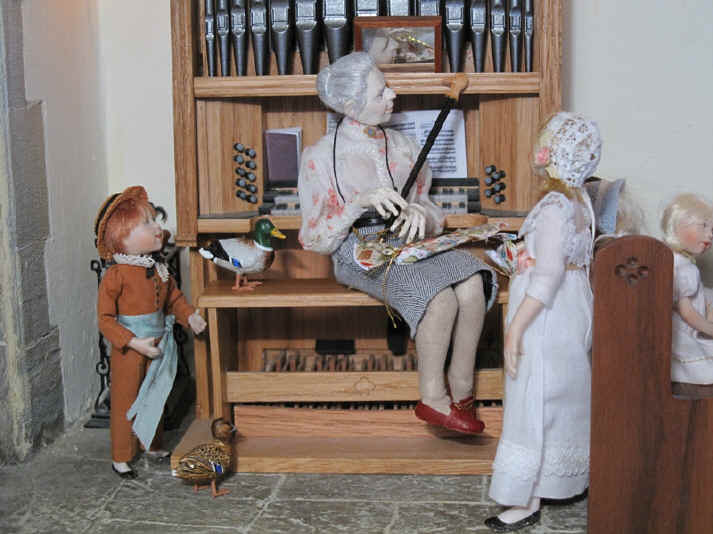 Homer is pleased because he is hoping Miss Enid will be kind enough to let HIM borrow it sometimes when he fancies practising on the organ! What is happening here? Esme and Ernest have been VERY worried about Miss Enid because she sometimes complains her knees hurt when she walks because of her arthritis. They really wish that they could earn money in order to buy her a a nice walking stick but know that they really don't NEED any money because they find all the food and shelter they need at the local village pond! The ducks are SO pleased. Can you see why? 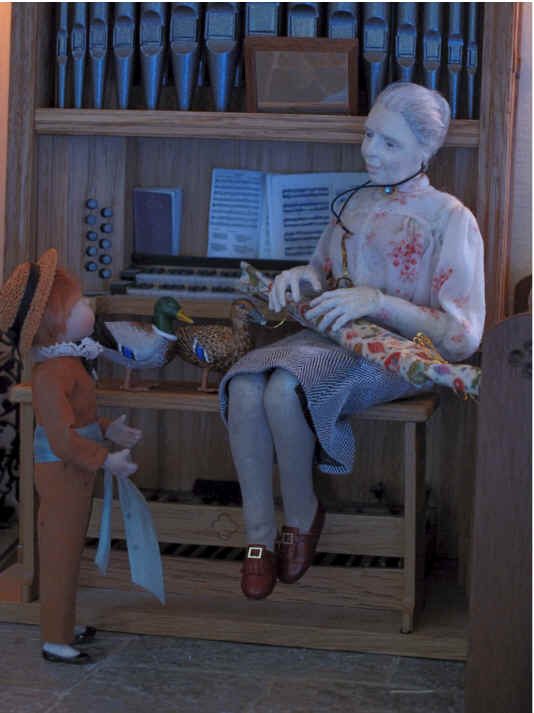 It is because Ambrose and Alice have been thoughtful enough to buy a special walking stick with a duck's head on to remind Miss Enid who REALLY gave it to her! They just LOVE it as Priscilla Jane shows it off to them here. Esther could see something was going on and has come over to see what is happening! 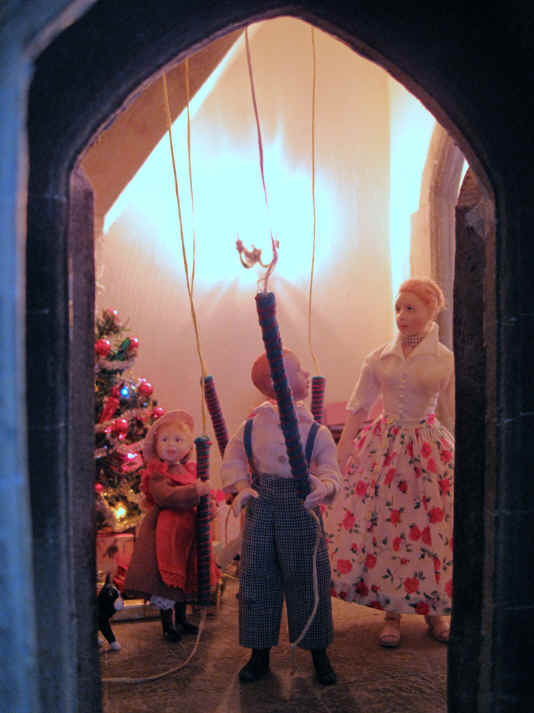 She tells them that she is worried Miss Enid may see the walking stick that Ambrose and Alice have bought as a Christmas present on behalf of Esme and Ernest for her. The children are now wrapping up the two presents for Miss Enid! Tom is holding the duck walking stick whilst Priscilla Jane is going to cut the paper out. Ambrose has brought an extra roll of Christmas paper in case Priscilla Jane needs some more! Bardsley, Magnifi-Cat and Belle just enjoy posing for the photograph! 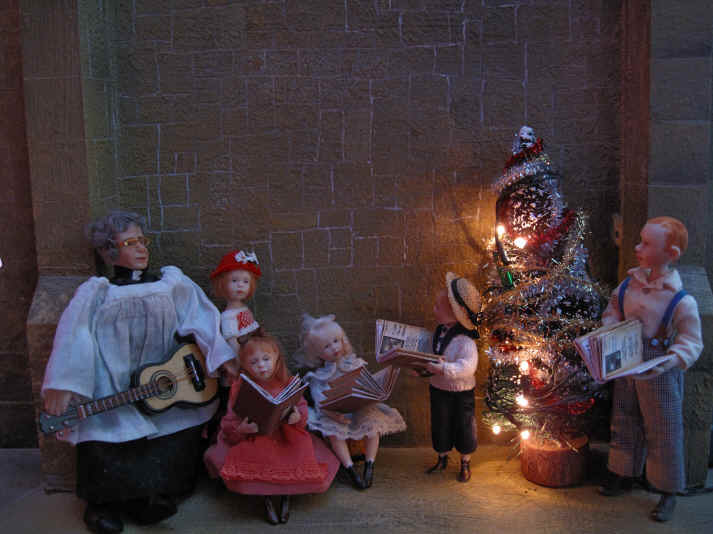 The children are really excited because, this year, they will be enjoying some carol singing around the Christmas tree in the churchyard and hope to also raise a few pennies for church funds! A kind member of the congregation has bought some carol books for them so they are really looking forward to using them this year! Tinker is trying to check the new carol books out that Ambrose and Esther have brought into church today. Esme and Ernest wish they could see inside the box too! Sepp......oh dear.....she really LOVES to sit on that bell tower step doesn't she?......but of course she is not daft because, unlike Tinker, Esme and Ernest...she CAN see inside the box from her exalted position! Rev Ken has brought his guitar along this early evening so that he can accompany the children singing. Poppy, his daughter, seeks sanctuary by sitting next to him whilst Amelia and Emily sit by his side. 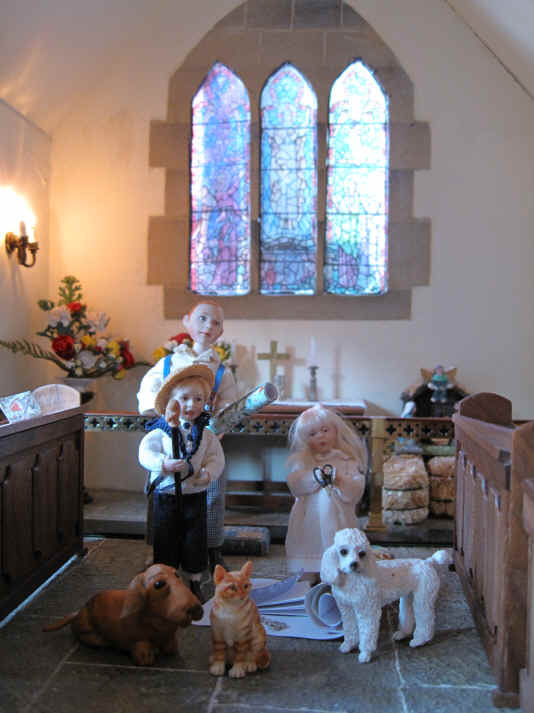 It is a good thing that Rev Ken and Poppy are close enough to see Amelia's carol book isn't it so that they can see the words of the carol they are now singing. 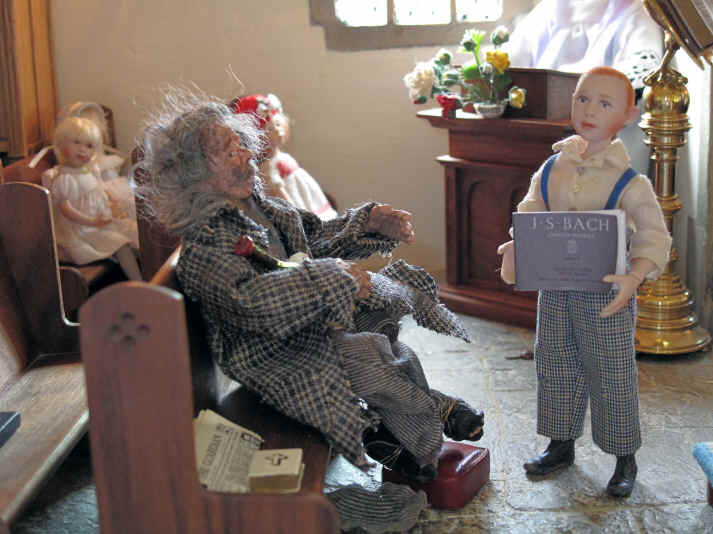 The children have been so excited and couldn't wait till Christmas morning to go to church! 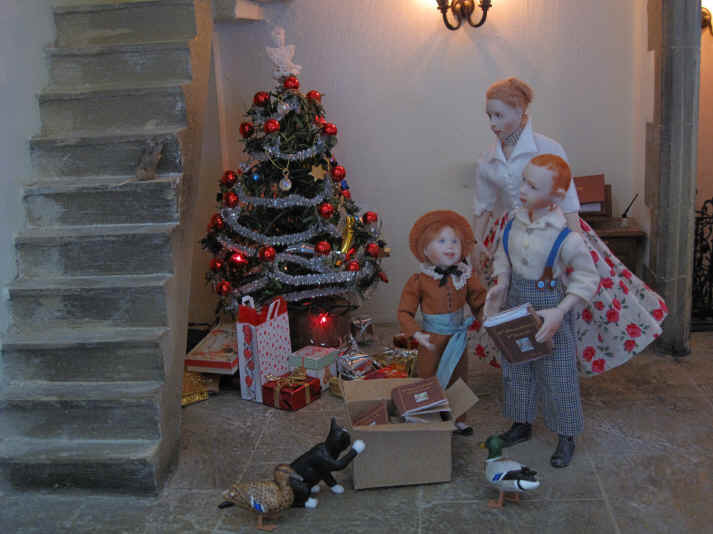 They were dying to see Miss Enid's face when she was presented with not just ONE present but TWO from them all! 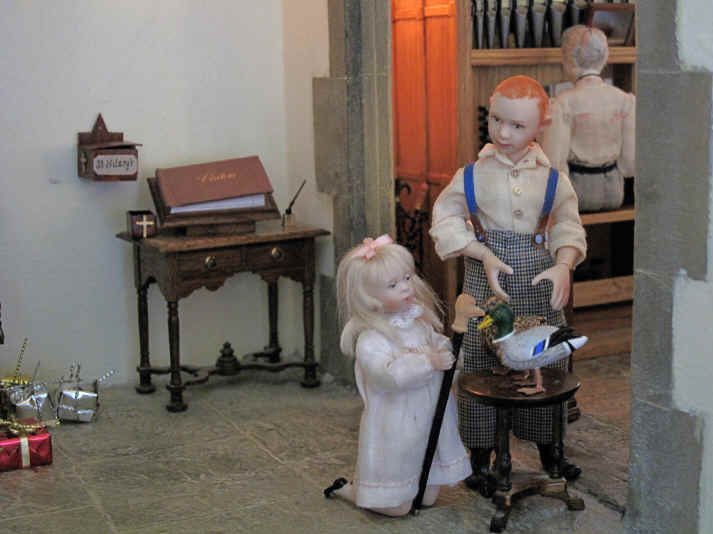 Esme and Ernest are the first to give her their present of a walking stick with a duck's head on it. Ben had to help them carry it to church though! Hasn't Priscilla Jane wrapped it up well for Esme and Ernest? She decided to make it look like a long cracker! Miss Enid is MOST amused as you can see. She is checking this new walking stick wtih a duck head VERY closely isin't she? Ernest was so excited as he watched her unwrap it. Alice too is here to see what Miss Enid thinks of her new walking stick. Miss Enid is clearly overcome! Adele has brought her ANOTHER present this Christmas morning. We hope Tom and Ben don't tell her what it is before she has opened it! Miss Esther is making sure everything goes smoothly. Phoebe hears Miss Enid give a huge exclamation of surprise and delight and so comes over to see her! Miss Enid is just thrilled with her present. She now knows that she will NEVER need to remember to renew this book at the library ever again and incur a fine every time she forgets! Phoebe already knows what this present is so she is quick to tell Miss Enid how she has been BURSTING to tell her but knew that it was a big secret til this morning! 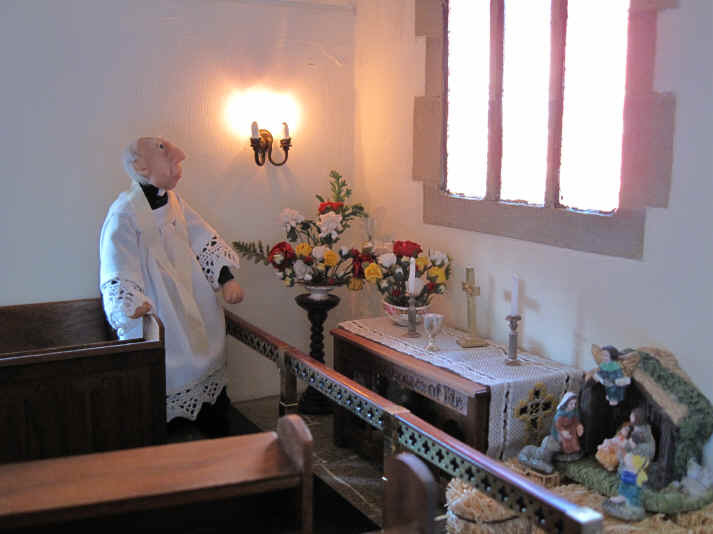 The vicar is enjoying some peace and quiet in the sanctuary whilst admiring the beautiful Christmas flower arrangements. He has had a great Christmas Day with the children and congregation but he is also looking forward to some peace and quiet too! Many thanks to Frances of Buttercup Miniatures for sending us this lovely crochet angel for the top of our Christmas tree!